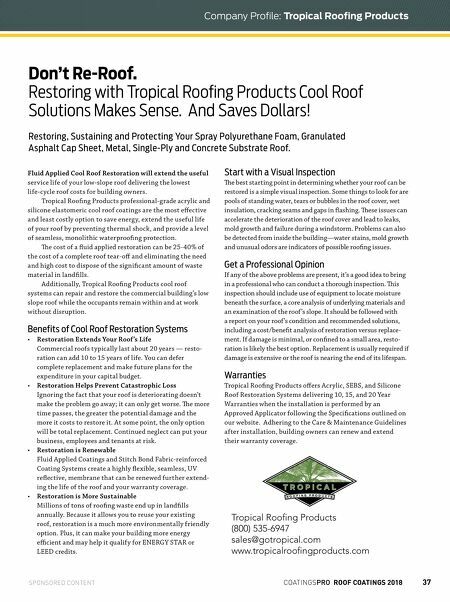 36 ROOF COATINGS 2018 COATINGSPROMAG.COM YOUR COMPLETE SILICONE ROOF RESTORATION RESOURCE www.tropicalroofingproducts.com FLORIDA 1904 SW 31ST AVENUE HALLANDALE, FL 33009 800.432.2855 CALIFORNIA 14435 MACAW STREET LA MIRADA, CA 90638 877.827.2622 TEXAS 1225 BRAI DRIVE PORT ARTHUR, TX 77640 866.727.0091 PACIFIC NORTHWEST 14325 NE AIRPORT WAY, SUITE 109 PORTLAND, OR 97230 844.854.9323 Single-Pass Application | Primerless in Most Applications | Recoatable Over Itself and Aged, Existing Silicone 60-120 Minute Tack-Free Time in Most Climates | Resistant to Light-Rain in 60-120 Minutes | Self-Leveling, No Treading | 18-Month Shelf-Life VOC Compliant (<50 g/L) | Miami-Dade NOA Approval, FM 4470 Approval, UL Listed, CRRC Rated, Florida Product Approval FBC Turn to TRP. Above all, it's what's on top that counts. 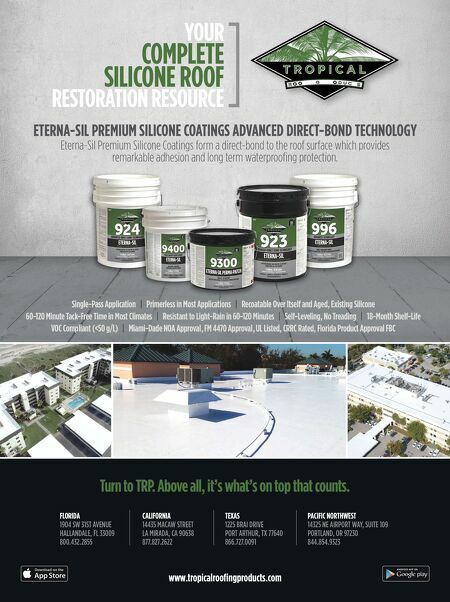 ETERNA-SIL PREMIUM SILICONE COATINGS ADVANCED DIRECT-BOND TECHNOLOGY Eterna-Sil Premium Silicone Coatings form a direct-bond to the roof surface which provides remarkable adhesion and long term waterproofing protection.